My Goal: to take beautiful images for her to use in spicing up her blog’s visual presence. My Plan: to photograph her cooking a meal from scratch from start to finish. 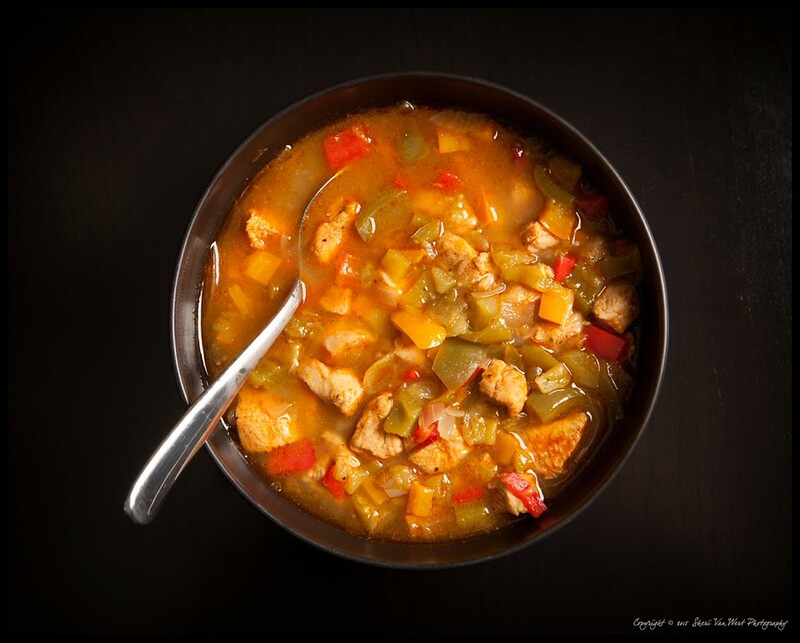 Debra specializes in making hearty and heartwarming soups and stews. She does feature other types of cooking on her blog (salads, BBQ, sandwiches, etc…), but her main passion is for soups/stews and the nutritious comfort they impart. For that reason, the meal she would be making while I hovered around her with my camera would be a tri-peppered chicken stew. My first set of shots: The Ingredients. 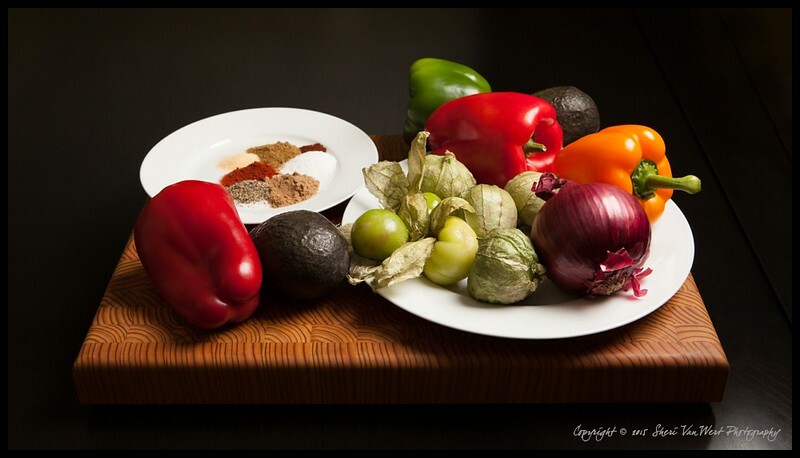 This board of brightly colored, fresh vegetables and spices is beautiful to behold. A bounty of aromatic plants is the base of what begins the alchemical process of making a delicious stew. If you are curious as to why onions are in practically every soup and stew recipe, I highly recommend you read “Cooked”, by Michael Pollen. You will come away from that book appreciating the magic that is cooking all that much more, as I do now! After I had my time with the vegetables, it was time to start chopping. I had her chop slower than usual so I could capture this fine process appropriately. 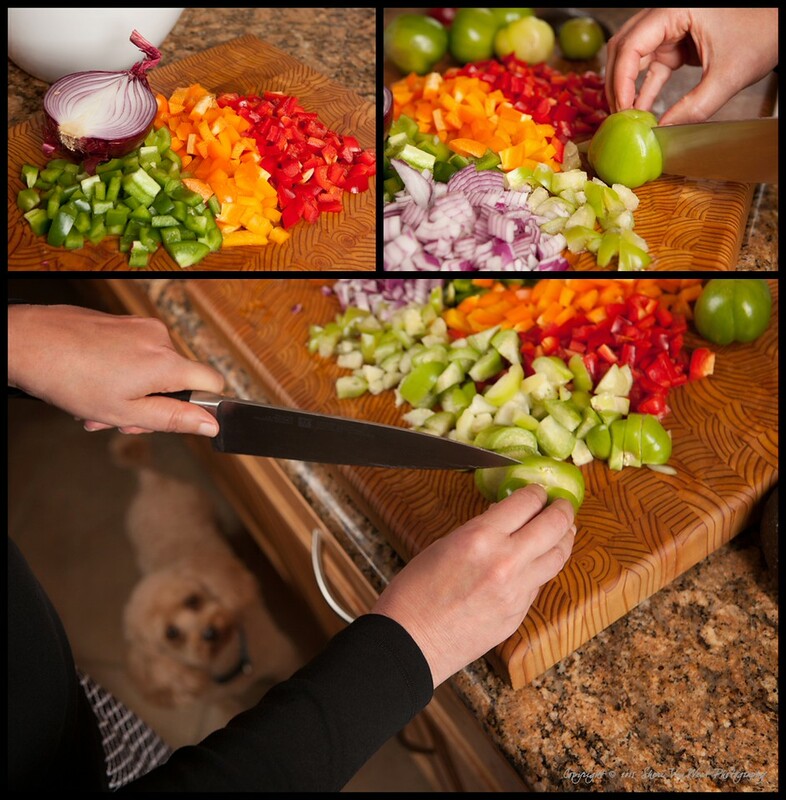 I was awed by her chopping skills as small and evenly sized bits of vegetables manifest before my eyes. Of course, I was comparing it to my own rather haphazard vegetable chopping! The main character of the stew, chicken, was placed on its own chopping block. The resulting pieces were placed in a ziplock bag and mushed around with the spices. Soon Debra was ready to turn on the heat. Do you notice the little friend hoping for a morsel of food to leap off the counter onto the ground? I love the smell of raw onions….weird I know…but I love the smell of sautéing onions even more which I think may be less weird. As each ingredient was sautéed and added together, the smells changed and intensified as the magic started to take place. Chemical compounds break down and mingle with one another, sending up steam which is laden with molecules destined to make your mouth water. 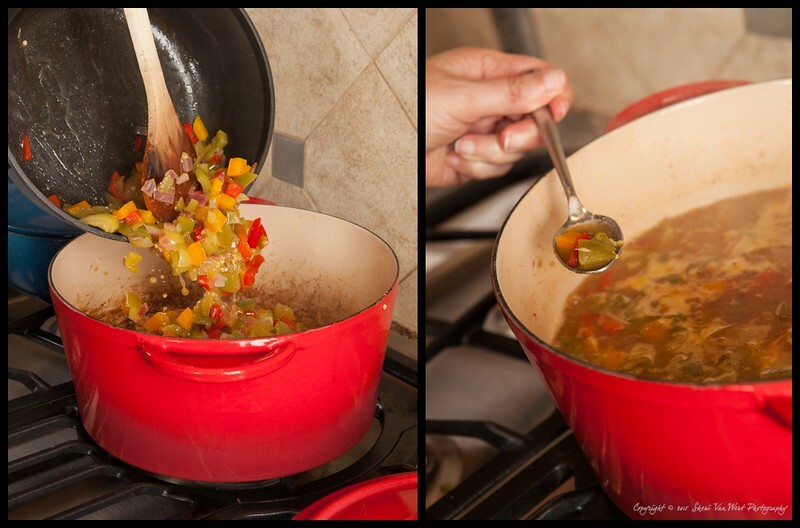 Lastly, the home made stock was added, and then…we waited. 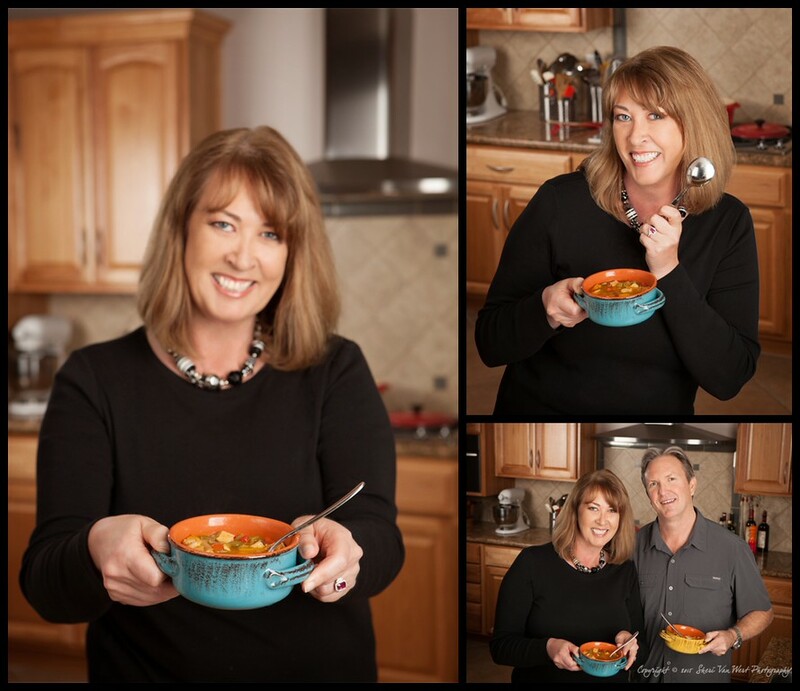 As the stew simmered on the stove, we talked, we laughed, and we made some head shots of the lovely Debra. I feel proud that she has one of my fine art landscape pieces hanging up in her kitchen! Recognize it? After a while, it was time to taste the stew. Ideally, Debra would allow a stew to simmer for hours, letting the flavors deepen as they mingle together in a way only time and low heat can enhance. But since this was a photo shoot (and I was charging by the hour) we indulged in the stew early so I could catch a moment of Debra with her husband, Dan, enjoying her delicious creation together. And that was how we ended this most fun session! I can personally attest to the deliciousness of this dish. On first bite it felt like all the tastebuds in my mouth were activated at once. A blend of tangy, spicy, and salty combined with the rich texture of the stew, left me going for a second helping. We live in an age of ubiquitous processed food (you can even get frozen PB&J for crying out loud), and the industrial food industry is constantly reminding us that we don’t have to cook anymore. We can have them do it for us (and make them rich in the process). I think we all know by now that cooking at home is healthier for both our bodies and minds. I try to cook at home as much as possible, but I admit to often feeling too tired, and battle an existential conflict with an annoying voice insisting that there may be a better use of my time than standing in the kitchen and chopping vegetables. Ultimately, however, when I give myself over to the task and relax into it, it always ends up being time well spent. Even when I make a disaster of a dish, I’ve learned something. It is encouraging to see so many friends in my generation interested in eating healthy and spending time with their children in the kitchen. The rise of the food blog is a great modern tool available to us as we rediscover the joys of cooking at home. 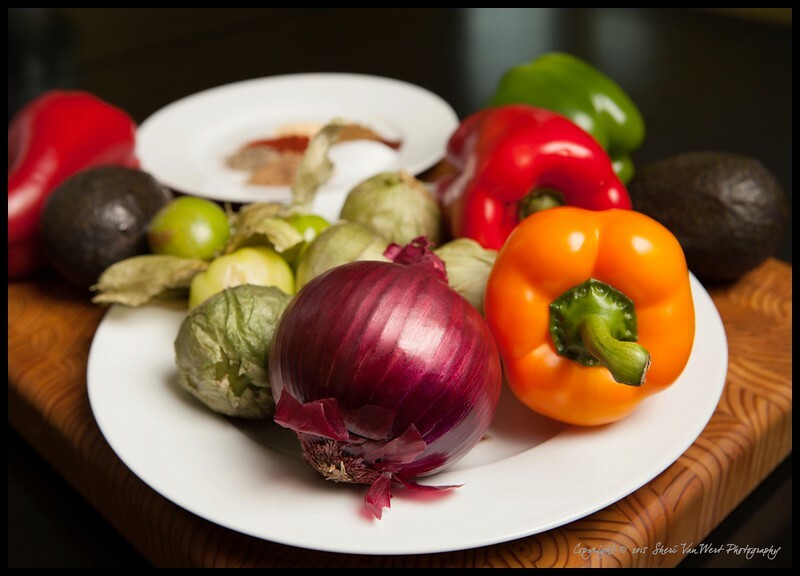 We can connect with foodies from all over the world to glean ideas for how to supply our daily nutritional needs. Be sure you don't miss a post by subscribing to my list. I also send exclusive content to my subscribers periodically, so make sure you are in the know! 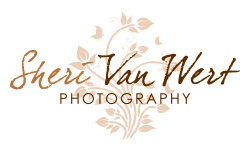 sheri van wert - Thank you so much Debra! Debra @ Bowl Me Over - So loved your visit and all the fun with had together Sheri! You're a very talented lady. I loved our session and look forward to doing it again!